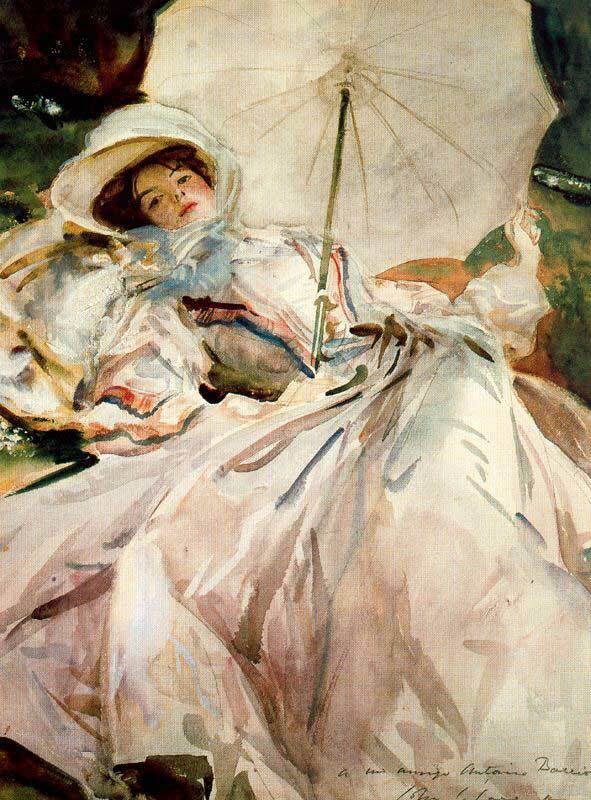 The colours in this painting below are mostly pale neutral, and would require less pigment on the brush. The first video is a demonstration of pigment to water ratio blobs. Remember, the sequence goes like this, water pigment palette paper, then pigment palette paper, and always mix your pigment in a small area and separately in the palette each time, this is to avoid picking up more water from a previous mix, and always mix your colours in a small area so you are not depositing more pigment on the palette than necessary. If your pigment are fresh from the tube they will be wet, so you must add tiny amounts to build up the intensity ( brightness gradually with each blob, if you have a blob that has gone too dark / intense too quickly, then clean your brush out, dry it a little on some kitchen roll, and manoeuvre your brush over the blob to lift out the excess pigment and start again. The value of painting a colour wheel is firstly to consolidate what you know about pigment to water ratio, as I want you to paint all the 12 segments at medium intensity, and practice your application to avoid streaks, ( see a previous video on wash application ) but also this will teach you about colour mixing, so you can understand what colours are intense ( bright ) and what colours are neutral ( dull )see above. 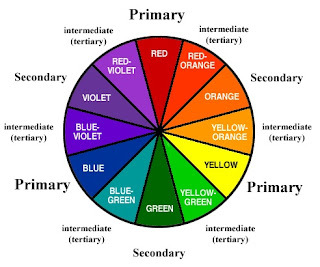 This colour wheel was designed by artists to help you understand which colours look good together, have another look at the painting of the dog, these colours are pleasing to the eye because they have been chosen carefully, the colour wheel can help you to achieve this, but again, more on that later. 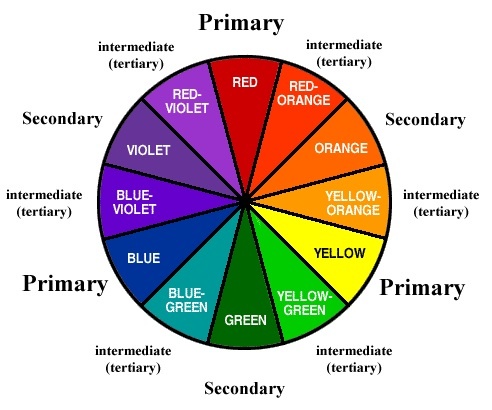 So, start by drawing a circle and dividing into 12 segments, this is made easier if you draw a cross through the centre, and draw a V shape inside each quarter, so that you have 3 segments in each quarter, please write the terminology next to each segment, where it says primary, secondary and tertiary, primary colours are unmixed with other colours, so we will use cadmium red, cadmium yellow, and ultramarine blue, start by painting in primary red, remember pigment palette paper, so we can see how intense the colour is in the palette before applying to the paper, clean your brush out and paint in your primary yellow, don't wash this yellow off your brush, but use it to pick up some of the red pigment in your palette to create an orange in the secondary segment, you are aiming at creating an orange that looks exactly half way between the red and the yellow, don't clean your brush out, use the orange on your brush to paint in the tertiary sections next to the red and yellow, you are aiming at creating a red orange, and a yellow orange, again, try to make them look half way between their neighbours, do this by eye on your painting, and don't try to duplicate the colours on the image below. Repeat this exercise creating greens and violets, however, you will find that using a combination of cadmium red and ultramarine will result in burgundy rather than the violet colours you see below. The film below is a demonstration of of a colour wheel which has already been started, note the alterations that need to be done to get the correct colour balance. 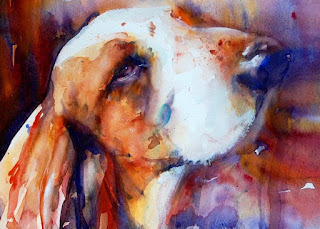 The exercise below is what I call a percentage mixing exercise, that is, how much to push the paint around on the paper, the object of this exercise is to know when to stop painting in order to preserve the amount of intensity you want in your watercolour, note the painting below is very neutral ( dull ) as opposed to the dog painting, the colours are just as beautiful, but not as intense ( bright ) this is not because the artist used only dull colours such as brown or grey, it is because the colours were pushed around on the paper more than in the dog painting, and like the tertiary colours on your colour wheel. Try the exercise in the video below, put a clear wash down first in 1 column, using lots of water, and apply red yellow and blue in the way you see demonstrated, making sure to start you application so each colour is not overlapped by another colour, in the 1st column allow your pigments to mix themselves by gravity only, your board should be tipped at an angle so the pigment and water can run down the page. The 2nd and 3rd column is started in the same way but in the 2nd you are going to push the pigments together a little resulting in more semi neutrals than on the 1st column, the 3rd column is pushed together 100% resulting in no visible intense colours, however you should have a more interesting neutral than if you had painted a column using only brown paint. 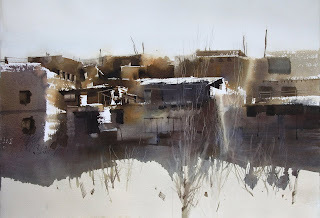 Please practice colour mixing at home, and also use plenty of water, see a previous post on painting a wash on how much water to use.